As of version 7.x BW systems contain a useful function of saving particular BW objects that is maintained via RSA1 into Favorites. This enables faster access to the objects as it doesn’t need to be lookup up the area there it belong as there are thousands of the objects. As an example one InfoObject that is normally accessible under InfoObject part of Modeling section of RSA1 can be also accessed via Favorites part of the same Modeling section of the RSA1. I was curious what the table name is where the objects of the Favorites are actually stored. 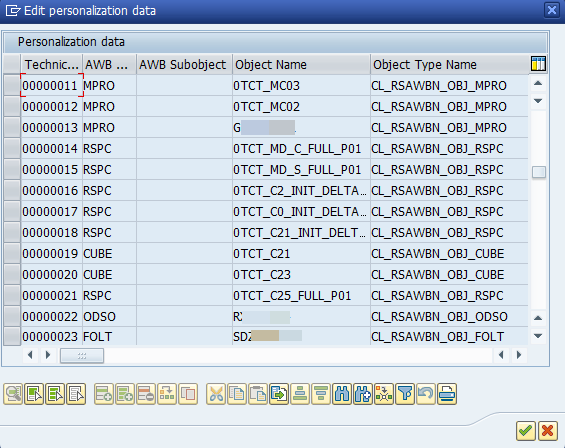 Whole processing of the Favorites is encapsulated in ABAP class CL_RSAWBN_SER_FAVORITES. For example method that loads the objects is LOAD_DATA. There are few tables within this functionality. 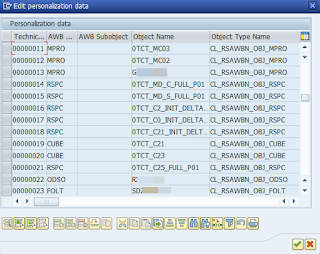 The table where the objects are stored is SPERS_OBJ - Personalization object repository. But this one is just a form of keys to the objects. The method later retrieves the objects types, its description and so on to be able to present them in the RSA1. Unfortunately there is no straightforward possibility to easy download/upload a list of objects that one inserted into the Favorites. This is contrary to regular SAP GUI favorites that can be downloaded/uploaded between the systems very easily (See post: Download/ Exporting of user’s favorites SAP GUI). However one easy trick is there to at least a get the type and name of objects but with hierarchical representation (like folders). To get the list go to t-codes SU01 or SU01D and navigate to Personalization. Find entry called RS_BI_DWB_FAVORITES - Favorites in the BI Data Warehousing Workbench and double click on it. This will get you a table of all the objects displayed in your Favorites area. The table can be printed to local file and objects can be saved offline by this procedure.